Spacious luxury villa with oversized private swimming pool and extensive lake views. Only 15min from Disney, easy access to I4 for Universal and close to Champions Gate Golf Resort. Located in Bridgewater Crossing, an award winning development set in 165 acre nature reserve. Hills Bay Retreat offers an open plan living area comprising of a fully equiped kitchen, informal dining/breakfast area and large famiily lounge, all with views and access via patio doors to the pool and decking area. Additional facilites are provided via a second lounge and formal dining area. The property is air conditioned throughout and includes free WiFi, cable TV and local calls. Pool Heating is available if required for a small charge. Fresh linen and towels are provided. Washer/ tumble dryer and ironing facilities are also available within the villa. The outside area features a large fully screened outsized pool with steps and underwater lighting. The extensive wrap around deck provides sun all day long while the under cover lanai provides ample shade if required. To the rear are extensive views across the lake and to the nature reserve beyond. The property is located in the popular Bridgewater Crossing, an award winning development set in a 165 acre nature reserve with pond, wetland and deepwater lake. 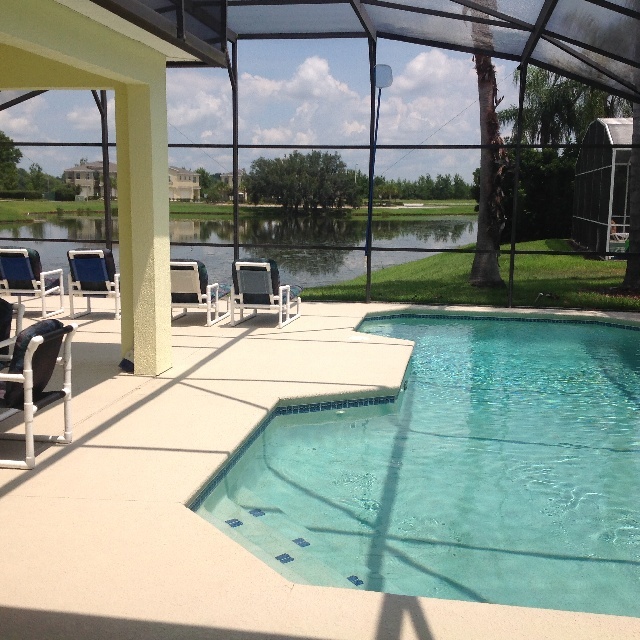 It is only 15mins from Disney and has quick and easy accesss to I4 or HW192 for Universal and all other attractions. Other facilities that are available within the development include a community swimming pool, tennis, basketball and volleyball courts and a 'tot-lot'. There are also lakeside walks and deep water fishing. Near the development is a filling station with convenience store, take out food and pizza service. Only 3 minutes away is the entrance to Champions Gate where there are two Greg Norman designed golf courses and a large Publix supermarket. BEDROOMS: master with fully equipped en-suite bathroom and TV, queen with own bathroom, twin and bunks bedrooms sharing a bathroom, plus sofa bed. Further child cot available free of charge. DINING: fully equipped kitchen with breakfast nook, separate formal dining area, al fresco with a gas barbeque in a covered outdoor poolside area. Child high chair provided. LOUNGE: large family area with cable TV/DVD and with access to pool area, plus smaller lounge area with CD. POOL: secluded, screened, oversized pool with underwater lighting. Large poolside seating area with both shaded and unshaded areas. Access from family lounge, master bedroom and dining room, together with side door entrance leading to bathroom. Child alarms on all doors leading to pool. 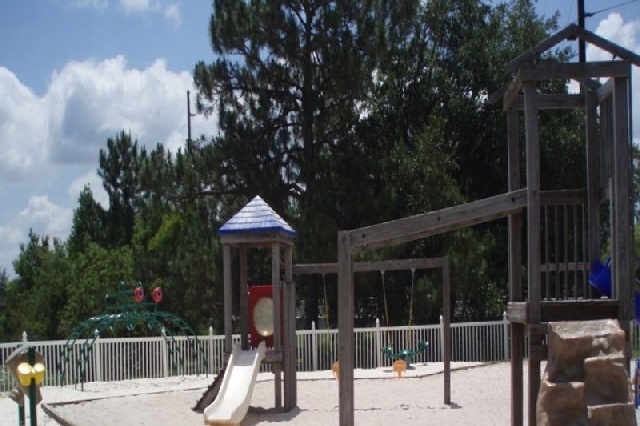 Hills Bay Retreat offers a truly versatile accomadation, perfect for 1,2 or 3 families sharing and has everthing you need for your Florida vacation. It is conveniently located for experiencing all that the area has to offer, whether as a winter haven, a tranquil retreat or as a base for your Disneyland vacation and the Universal Orlando resorts.